Hello! This past week I whipped up some super fast projects I want to share with you all. First, there is a weird inside joke between me and a few families. We have a mascot- FrogDog. I wanted to honor them with a rendition they could physically cuddle. He is a magical FrogDog that was once a human and he can talk. The only thing this plushie is missing is a tear-soaked foot. Maybe you are lost with my description, but that might be a good thing. We are a little... weird. After I made FrogDog, the kids asked me to make them something as well. For Kaelyn I made a little pink and white triangle scarf-hat thing. Sebastian asked for a scarf. "I hear scarfs are good for keeping your neck warm." That kid cracks me up! What was fun with these two projects is that I learned a few new stitches. In Kaelyn's kerchief I made granny squares and in Sebastian's scarf I used the cluster stitch. Do you have a project that needs to be finished up? 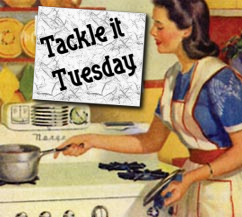 Tackle it today!